Wavecrest Blog » Blog Archive » Wavecrest Computing announces CyBlock Hybrid’s new reporting features. « Another exciting new enhancement from Wavecrest…Cyfin Automatic Log File Detection! Wavecrest Computing announces CyBlock Hybrid’s new reporting features. Wavecrest Computing announces new reporting features are now available in the CyBlock Hybrid deployment. Reporting features, Real-Time Monitor and Dashboard Charts, can easily be accessed for both your CyBlock Cloud and local CyBlock configurations. This enhancement allows the customer to easily monitor and develop reports on users, both local and remote. Use Real-Time Monitor to see remote users’ current Web activity, or use Dashboard Charts to check on- or off-premises Web traffic trending by users, groups, categories, or denied and allowed traffic. Run a report for management or an audit that can include cloud, local, or all configurations. The new features proactively increase your administration capabilities while reducing the time you spend on Web management tasks. 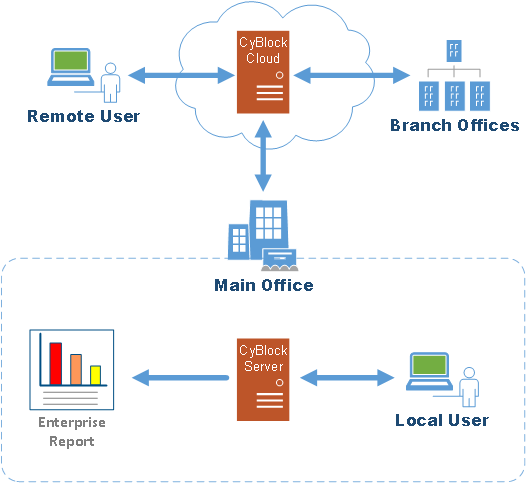 The CyBlock Hybrid deployment is used when an on-site CyBlock installation is paired with CyBlock Cloud to provide coverage of remote users with the convenience of local administration for all users. Contact us for more information today! Constantly improving, developing, and enhancing to make your Web security more efficient, Wavecrest Computing has been the recognized leader in Web Security Solutions for over 19 years. Wavecrest’s scalable filtering and forensic reporting analysis product lines, CyBlock and Cyfin, are designed to enable organizations to successfully address Internet abuse, legal liability, shadow IT, workforce productivity, malware, and many other Web security threats.